Chronic obstructive pulmonary disease (COPD) is a leading cause of morbidity and mortality worldwide. For many patients, maximal therapy for COPD produces only modest or incomplete relief of disabling symptoms and these symptoms result in a significantly reduced quality of life. Despite the high morbidity and mortality associated with severe COPD, many patients receive inadequate palliative care. There are several reasons for this. First, patient–physician communication about palliative and end-of-life care is infrequent and often of poor quality. Secondly, the uncertainty in predicting prognosis for patients with COPD makes communication about end-of-life care more difficult. Consequently, patients and their families frequently do not understand that severe COPD is often a progressive and terminal illness. The purpose of the present review is to summarise recent research regarding palliative and end-of-life care for patients with COPD. Recent studies provide insight and guidance into ways to improve communication about end-of-life care and thereby improve the quality of palliative and end-of-life care the patients receive. Two areas that may influence the quality of care are also highlighted: 1) the role of anxiety and depression, common problems for patients with COPD; and 2) the importance of advance care planning. Improving communication represents an important opportunity for the improvement of the quality of palliative and end-of-life care received by these patients. Chronic obstructive pulmonary disease (COPD) is the fourth leading cause of mortality and the 12th leading cause of disability worldwide 1, 2. By the year 2020, COPD will be the third leading cause of mortality and the fifth leading cause of disability worldwide 3–5. For many patients, maximal therapy for COPD produces only modest relief of symptoms, leaving patients with significantly reduced health-related quality of life. Many patients with COPD receive inadequate palliative care. The purpose of the present review is to examine problems in the delivery of high-quality palliative care to patients with severe COPD and to identify ways in which to address these problems. Since other articles in the series have discussed treatment of dyspnoea and other symptoms and improving quality of life, the current review will focus on communication about palliative and end-of-life care. The goal of palliative care is to prevent and relieve suffering and to support the best possible quality of life for patients and their families, regardless of the stage of disease or the need for other therapies 6. The World Health Organization adopted the following definition of palliative care: “Palliative care means patient and family-centered care that optimizes quality of life by anticipating, preventing, and treating suffering. Palliative care throughout the continuum of illness involves addressing physical, intellectual, emotional, social and spiritual needs and to facilitate patient autonomy, access to information and choice” 7. As such, palliative care expands traditional treatment goals to include: enhancing quality of life; helping with medical decision making and identifying the goals of care; addressing the needs of family and other informal caregivers; and providing opportunities for personal growth 6. In contrast, the term “end-of-life care” usually refers to care concerning the final stage of life and focuses on care of the dying person and their family. The time period for end-of-life care is arbitrary and should be considered variable depending on the patient's trajectory of illness 8, 9. Using these definitions, palliative care includes end-of-life care, but is broader and also includes care focused on improving quality of life and minimising symptoms before the end-of-life period, as depicted in figure 1⇓. Although end-of-life care usually refers to care in the final months, weeks or days, there is growing evidence that communication with patients and families about their preferences for end-of-life care should occur early in the course of a chronic life-limiting illness, in order to facilitate high-quality palliative and end-of-life care. The present review will summarise some of this evidence, particularly as it pertains to patients with severe COPD. 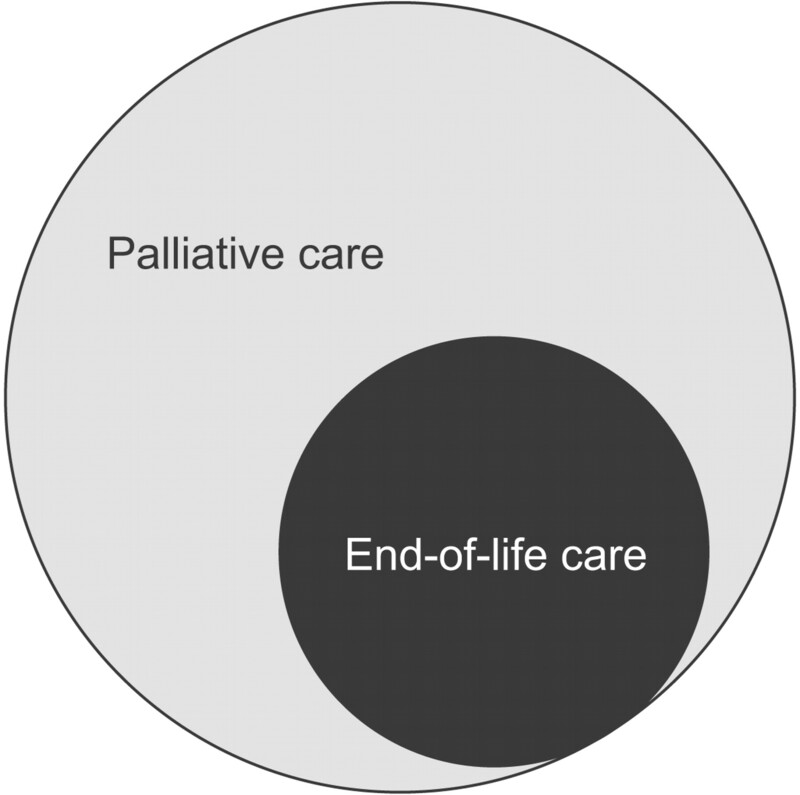 Schematic diagram for use of the terms “palliative care” and “end-of-life care”. The Study to Understand Prognosis and Preferences for Outcomes and Treatments (SUPPORT) enrolled seriously ill, hospitalised patients in one of five hospitals in the USA with one of nine life-limiting illnesses, including COPD 10. Compared with patients with lung cancer, patients with COPD were much more likely to die in the intensive care unit (ICU), on mechanical ventilation, and with dyspnoea 11. These differences occurred despite most patients with COPD preferring treatment focused on comfort rather than on prolonging life. In fact, SUPPORT found that patients with lung cancer and patients with COPD were equally likely to prefer not to be intubated and not to receive cardiopulmonary resuscitation (CPR), yet patients with COPD were much more likely to receive these therapies 11. A study in the UK also found that patients with COPD are much less likely to die at home and to receive palliative care services than patients with lung cancer 12. Additional studies have documented the poor quality of palliative care and significant burden of symptoms among patients with COPD 13. Healthcare for these patients is often initiated in response to acute exacerbations rather than being initiated proactively based on a previously developed plan for managing their disease 14. A recent study of patients with COPD or lung cancer in the US Veterans Affairs Health System also found that patients with COPD were much more likely to be admitted to an ICU, and have greater lengths of stay in the ICU during their terminal hospitalisation, than patients with lung cancer. In the same study, significant geographic variation in ICU utilisation was found for patients with COPD 15. Although variation in care may be influenced by many factors including availability, access and reimbursement issues, such geographic variation suggests a lack of consensus concerning the best approach to palliative and end-of-life care for patients with COPD. In summary, there are important opportunities for research and quality improvement if better palliative and end-of-life care is to be provided for patients with severe COPD. In COPD, it may be difficult to identify those patients who are likely to die within 6 months. The prognostic models used in SUPPORT, which were based on the Acute Physiology and Chronic Health Evaluation II, documented this difficulty. These models showed that, at 5 days prior to death, patients with lung cancer were predicted to have <10% chance of surviving for 6 months, while patients with COPD were predicted to have >50% chance 11. Recent efforts to identify disease-specific prognostic models for patients with COPD do improve prognostic accuracy, but do not predict individual short-term survival as well as can be done for many patients with cancer 16–18. Therefore, uncertainty concerning prognosis plays a more prominent role in discussions of prognosis and end-of-life care for patients with COPD than for patients with cancer. As physicians have difficulty discussing prognosis in the setting of uncertainty 19, it is not surprising that they also struggle with knowing when to raise issues about end-of-life care. Nevertheless, it remains the responsibility of physicians caring for patients with severe COPD to educate them about end-of-life care and to ensure that they receive care consistent with their informed preferences for care at the end of life. Despite the uncertainty, a profile emerges of the types of patients at high risk of mortality or morbidity over the next 6 months. Physicians should be encouraged to identify patients with COPD for whom discussions about treatment preferences or end-of-life care are especially important 20. This profile could include an assessment of: forced expiratory volume in one second (FEV1) <30% predicted; oxygen dependence; one or more hospital admissions in the previous year for an acute exacerbation of COPD; left heart failure or other comorbidities; weight loss or cachexia; decreased functional status; increasing dependence on others; and age >70 yrs (table 1⇓). The presence of two or more of these prognostic indicators should be a reason for such discussions. Multiple criteria increase the relevance and urgency for the discussion, as they increase the risk for a life-threatening exacerbation and for receiving care at the end of life that is not consistent with their informed treatment preferences. It is also important that clinicians understand patient preferences for end-of-life care and provide them with an opportunity to discuss these issues. Most patients with life-limiting illness prefer to discuss their preferences for end-of-life care relatively early in the course of their illness 21, as these discussions are less stressful when the patient is feeling relatively well. Although most patients with COPD will prefer a trial of mechanical ventilation for acute respiratory failure, raising these issues in advance of the requirement makes it easier to revisit these discussions when patients are unwell 21, 22. Studies have shown that only a minority of patients with moderate-to-severe COPD have discussed treatment preferences and end-of-life care issues with their physicians 23–25 and most believe that their physicians do not know their preferences for end-of-life care 24, 25. The current author’s group recently found that only a third of patients with oxygen-dependent COPD had discussed end-of-life care with their physicians and <25% of physicians had discussed some important aspects of end-of-life care with their patients, including talking about how long the patient might live and what dying might be like for the patient and the family 23. The study also examined the items that patients with COPD rated as being performed most poorly, which included talking about prognosis. Therefore, improved communication regarding end-of-life care, prognosis and dying needs to be targeted. A recent study by McNeely et al. 26 examined the perspectives of Canadian respirologists on communication about end-of-life care for patients with COPD. When respirologists discussed mechanical ventilation for end-stage COPD, the discussions occurred late in the disease trajectory, most commonly taking place in the ICU, with only 23% occurring in the clinic or office 26. It was found that 84% of physicians waited until dyspnoea was severe and 75% waited until the FEV1 was <30% pred. A survey of 214 general practitioners in the UK found that, although 82% felt that general practitioners should discuss the prognosis with patients with COPD, only 41% reported “often” or “always” discussing prognosis with these patients 27. Furthermore, two thirds of these physicians who reported infrequently discussing end-of-life care reported feeling inadequately prepared to have such discussions. These studies suggest that communication about end-of-life care is an important area for improvement in the care of patients with COPD. There are a number of studies that provide some specific direction for physicians in their communication about end-of-life care for patients with severe COPD. One qualitative study compared patients with severe COPD to patients with metastatic cancer or advanced AIDS, noting that patients with COPD were more likely to express concern about the lack of education that they received about their disease 28. Patients with COPD wanted more information in the following five specific areas: diagnosis and disease process, treatment, prognosis, what dying might be like, and advance care planning (table 2⇓). A qualitative study of patients with severe COPD in the UK also showed that most, but not all patients wanted more information about their prognosis 29. In a survey of older patients with serious illnesses and limited life expectancy, just over half (56%) of participants with COPD wanted to know their life expectancy 30. Often, family members may want this information even when patients do not 31. Therefore, it is important to determine how much information about prognosis patients and family members want. Expert recommendations suggest numeric expressions of risk (e.g. “eight out of 10 people will have side-effects from this drug”) generally lead to better comprehension than do qualitative expressions of risk (e.g. “this drug is very likely to cause side-effects”) 32. Moreover, since prognostic information applies to outcomes of groups of patients, experts recommend that prognostic information be phrased in terms of outcomes for populations rather than in terms of individual outcomes (e.g. “out of a group of 100 patients like your mother, I would expect about 10 to survive this”) 33. In addition, because some individuals do not wish to receive prognostic information, experts recommend the “ask-tell-ask” approach to discussing prognosis 34–36. For this approach, physicians first seek permission to discuss prognosis prior to doing so and afterwards ask patients and families their understanding of the prognosis to ensure comprehension. Table 3⇓ summarises some of these recommendations for discussing prognosis. Another area of communication that was rated as poorly performed by patients with severe COPD was asking about the patients' spiritual or religious beliefs 23. Several studies suggest that the majority of patients want to discuss spiritual or religious issues with their physicians, although some patients do not have a strong preference and others have a preference to not have such discussions with physicians 37–39. Studies from Europe suggest that physicians' religion may be an important determinant of the care patients receive 40, 41. Several reviews suggest approaches that physicians can take in determining whether patients want to discuss the patient's religion and spirituality and having these discussions with patients 42, 43, although empirical data about which specific techniques improve patient experience are limited. An important step towards improving communication about end-of-life care is to identify the barriers to this communication and implement strategies to overcome them. A recent study of patients with oxygen-dependent COPD examined the barriers to communication about end-of-life care and noted them to be many, diverse and patient-specific 22. Although 15 barriers were identified, only two were endorsed by >50% of patients, suggesting that an individualised process is required. The two most commonly mentioned barriers were: “I'd rather concentrate on staying alive than talk about death” and “I'm not sure which physician will be taking care of me if I get very sick.” The former suggests the need for skill in talking about a difficult subject with patients who would rather not discuss it. Although many patients do not wish to discuss dying and death, these same patients often have strong opinions about CPR and mechanical ventilation 44. Among patients in SUPPORT who did not want to discuss CPR, 25% did not want to have CPR and among those who did not want to discuss mechanical ventilation, 80% did not want to have prolonged mechanical ventilation. Therefore, it may be important to have these discussions even with patients who are reluctant to do so. It may be helpful in these situations to acknowledge that discussions about dying can be difficult, but are nonetheless important for patients, families and physicians to undertake, and may provide an opportunity to decrease the burden of decision making on family members. It can also be useful to explicitly state that such a discussion will not diminish the physicians' focus on finding therapies to improve survival or quality of life, as some patients worry that such a discussion might cause a physician to “give up” on them 45. Another useful tool for raising these discussions may be to frame them in the context of “hoping for the best, while preparing for the worst” 46. The other most common barrier, “I'm not sure which physician will be taking care of me if I get very sick,” suggests that patients may fear abandonment by their physicians at the end of life and that discussions of continuity of care between physicians and patients may be an important component of discussions about dying and death. In a qualitative study of patients with severe COPD, metastatic cancer or advanced AIDS, concerns about continuity of care and abandonment emerged as important for patients with each of these diseases 21, 47. The most common physician-endorsed barriers to communication about end-of-life care 22 include: “There is too little time during our appointments to discuss everything we should”; “I worry that discussing end-of-life care will take away his/her hope”; and “The patient is not ready to talk about the care s/he wants if s/he gets sick.” These barriers suggest that interventions also need to target physicians and address systems-level issues, such as ensuring adequate time for discussions about end-of-life care. Some patients prefer a direct approach to discussing prognosis, while others prefer a more indirect approach 31. There is no relationship between the number of barriers endorsed by patients and the number endorsed by their physicians 22. This lack of an association suggests that encouraging interventions may be more successful if they target both patients and physicians. Although anxiety and depression are common in COPD, they are not well recognised or treated 48–52. In a recent study, only a third of patients with COPD and clinically significant depression or anxiety were being treated and only half of those with severe depression or anxiety were being treated 53. Antidepressants can significantly improve mood among patients with COPD and depression 54. Furthermore, in patients with COPD and depression, antidepressants can also decrease ratings of dyspnoea and other physical symptoms 54. Anxiety and depression may modify patients' treatment preferences concerning end-of-life care. Patients with COPD and a higher burden of depressive symptoms have a stronger preference against CPR 55. This association is similar to findings of two prior investigations, one from SUPPORT 10 and one by Blank et al. 56, which assessed preferences for CPR, but not specifically for patients with COPD. Patients with depression are more likely to change their treatment preferences after depression resolves 57. They also rate the quality of patient–physician communication about end-of-life care significantly lower than those without depression 23. It is unclear whether this finding reflects an effect of depression on patients' ratings of the quality of communication or whether the quality of communication is negatively influenced by depression but, regardless of the reason, it is important for physicians to be aware of this relationship between depression and quality of communication about end-of-life care. Simply put, the presence of anxiety and depression may influence the patient's ability to understand the impact of decisions that they make and therefore, if possible, these symptoms should be treated prior to end-of-life decision making. Another noteworthy finding about treatment preferences was that health status, as measured by the Saint George's Respiratory Questionnaire, was not associated with end-of-life treatment preferences in a population of patients with severe COPD 55. These data confirm and extend the results of two prior studies performed in elderly outpatients without severe comorbidities 58 and in seriously ill, hospitalised patients with several different primary diagnoses 59. Healthcare providers should not assume that poorer health status is necessarily associated with a higher likelihood of refusing life-sustaining treatment. Since physicians consistently underestimate patients' quality of life compared with the patients' own assessments 60, 61 and since there is evidence that physicians' estimates of patients' treatment preferences are influenced by the physicians' estimates of patients' quality of life 62, it is important that physicians caring for patients with severe COPD examine their own assumptions and directly obtain treatment preferences from patients. A recent survey from Europe showed that physicians and nurses placed more value on quality of life and less value on prolonging life than patients or family members 63. Clinicians should keep this difference in mind and avoid inappropriately imposing their values on patients and their families. There has been considerable dissatisfaction with the lack of effects of advance directives on end-of-life care 64. A number of studies suggest that advance directives do not influence the treatments that patients receive 65–67 and do not change end-of-life decision making 68–70. It is clear that advance directives in the absence of good communication about end-of-life care do not improve the quality of end-of-life care. However, in the context of good communication between patients, families and physicians, advance directives may be an important component to end-of-life care. In addition, some studies suggest that the presence of advance directives are associated with decreased levels of stress and increased ratings of the quality of care among family members of dying patients 71, 72. Advance directives may be especially useful among patients with COPD because of their likely trajectory of illness, with unpredictable exacerbations that may make patients suddenly critically ill 8. In addition, some patients with COPD have strong feelings about the situations in which they would want to forego CPR or, particularly relevant for COPD, mechanical ventilation for acute respiratory failure. Other authors have reported on the development of COPD-specific advance directives for this purpose, although there have not been studies showing that these advance directives improve the quality of end-of-life care 73, 74. Nonetheless, advance directives are a topic that should be discussed with all patients with moderate or severe COPD as part of advance care planning and other aspects of communication about end-of-life care. For patients who have experienced noninvasive or invasive ventilation in the past, physicians have the opportunity to use patients' prior experiences as a reference point for discussing potential future episodes of acute respiratory failure and those circumstances under which they would not want these types of ventilation. Patients' prior experiences with life support, or with relatives or friends who have required life support, can be important facilitators to patient–physician communication about treatment preferences and end-of-life care 22. Some patients with COPD will die from lung cancer or cardiovascular disease 2, 75, whereas others die from progressive respiratory dysfunction, or a systemic complication of it 14. Physicians caring for patients dying with severe COPD may need to consider the value of treating their comorbidities in the setting of advanced and terminal COPD. For example, indications for treatment of hypertension may change as COPD advances. Physicians should consider physiological changes as patients become progressively closer to death and reassess the risks and benefits of the treatments for these comorbidities 76. Improvements in care of the dying have been largely confined to patients in hospice care and specifically to patients with cancer 77. Patients dying of progressive COPD are less likely to be offered the opportunity to benefit from hospice services when compared with patients with cancer 12. The illness trajectory among patients with COPD is more likely to be a gradual slow decline interspersed with unpredictable acute exacerbations, which are often followed by an improvement back towards, but not quite reaching, their pre-exacerbation baseline 9. This trajectory does not fit the traditional hospice model well and may be part of the reason that patients with COPD are less likely to receive hospice and palliative care services. However, understanding this trajectory and discussing it with patients and their families may offer an opportunity to adapt hospice and palliative care services to meet the needs of these patients and their families 8. Accomplishing this goal represents one of the most important challenges to improving end-of-life care for patients with severe COPD. Patients with COPD are at risk for respiratory failure and recent advances in the use of noninvasive ventilation raise questions about the use of this technology in the palliative care setting. The use of noninvasive ventilation for patients who choose to forego invasive mechanical ventilation is relatively common in Europe, with approximately one third of patients who receive end-of-life care in the hospital receiving noninvasive ventilation as the most aggressive form of ventilation before death 78. A recent Society of Critical Care Medicine Task Force provided a systematic approach to considering noninvasive ventilation in palliative care settings, and concluded that although noninvasive ventilation may be appropriate as a form of life support for patients who choose to forego invasive ventilation, current literature does not support the routine use of noninvasive ventilation for the sole purpose of palliation of symptoms 79. Furthermore, most hospice settings do not have familiarity with noninvasive ventilation and this lack of familiarity increases the risk for harm and decreases the chance of benefit from noninvasive ventilation. In summary, palliative care is an important component in the treatment of patients with severe chronic obstructive pulmonary disease. There is strong evidence to suggest that patients with chronic obstructive pulmonary disease receive poor-quality palliative care compared with patients with cancer 11, 12, 14. One reason these patients may receive poor-quality palliative care is that patient–physician communication about end-of-life care is unlikely to occur, or only occurs late in the illness 23–25. The quality of this communication is likely to be poor and current models for training physicians in communication about end-of-life care are inadequate 23, 27, 80. Understanding the barriers to this communication may be an important step to improving it 22. Furthermore, recognising the importance of anxiety and depression will also be important when discussing palliative and end-of-life care 55. Advance directives and good advance care planning offer an opportunity for improving the quality of palliative care received by patients with severe chronic obstructive pulmonary disease. Finally, hospice and palliative care services represent an important opportunity for improving end-of-life care, but clinicians caring for patients with chronic obstructive pulmonary disease must find more effective ways to utilise these services. Previous articles in this series: No. 1: Viegi G, Pistelli F, Sherill DL, Maio S, Baldacci S, Carrozzi L. Definition, epidemiology and natural history of COPD. Eur Respir J 2007; 30: 993–1013. No. 2: Fabbri LM, Luppi F, Beghé B, Rabe KF. Complex chronic comorbidities of COPD. Eur Respir J 2008; 31: 204–212. No. 3: Hill K, Geist R, Goldstein RS, Lacasse Y. Anxiety and depression in end-stage COPD. Eur Respir J 2008; 31: 667–677. No. 4: Albert P, Calverley PMA. Drugs (including oxygen) in severe COPD. Eur Respir J 2008; 31: 1114–1124. No. 5: Clini EM, Ambrosino N. Nonpharmacological treatment and relief of symptoms in COPD. Eur Respir J 2008; 32: 218–228. Pauwels RA, Buist AS, Calverley CR, Hurd SS. on behalf of the GOLD Scientific Committee. Global strategy for the diagnosis, management, and prevention of Chronic Obstructive Pulmonary Disease, NHLBI/WHO Workshop Summary. Am J Respir Crit Care Med 2001;163:1256–1276. Mannino DM. COPD: epidemiology, prevalence, morbidity and mortality, and disease heterogeneity. Chest 2002;121: Suppl. 5 121S–126S. Michaud CM, Murray CJ, Bloom BR. Burden of disease – implications for future research. JAMA 2001;285:535–539. Murray CJ, Lopez AD. Alternative projections of mortality and disability by cause 1990–2020: Global Burden of Disease Study. Lancet 1997;349:1498–1504. Sullivan SD, Ramsey SD, Lee TA. The economic burden of COPD. Chest 2000;117: Suppl. 2 5S–9S. National Consensus Project for Quality Palliative Care: Clinical Practice Guidelines for quality palliative care, executive summary. J Palliat Med 2004;7:611–627. Murray SA, Kendall M, Boyd K, Sheikh A. Illness trajectories and palliative care. BMJ 2005;330:1007–1011. Lunney JR, Lynn J, Foley DJ, Lipson S, Guralnik JM. Patterns of functional decline at the end of life. JAMA 2003;289:2387–2392. The SUPPORT Principal Investigators. A controlled trial to improve care for seriously ill hospitalized patients: The Study to Understand Prognoses and Preferences for Outcomes and Risks of treatments (SUPPORT). JAMA 1995;274:1591–1598. Claessens MT, Lynn J, Zhong Z, et al. Dying with lung cancer or chronic obstructive pulmonary disease: insights from SUPPORT. J Am Geriatr Soc 2000;48: Suppl. 5 S146–S153. Elkington H, White P, Addington-Hall J, Higgs R, Pettinari C. The last year of life of COPD: a qualitative study of symptoms and services. Respir Med 2004;98:439–445. Au DH, Udris EM, Fihn SD, McDonell MB, Curtis JR. Differences in health care utilization at the end of life among patients with chronic obstructive pulmonary disease and patients with lung cancer. Arch Intern Med 2006;166:326–331. Skilbeck J, Mott L, Page H, Smith D, Hjelmeland-Ahmedzai S, Clark D. Palliative care in chronic obstructive airways disease: a needs assessment. Palliat Med 1998;12:245–254. Ramirez-Venegas A, Sansores RH, Perez-Padilla R, et al. Survival of patients with chronic obstructive pulmonary disease due to biomass smoke and tobacco. Am J Respir Crit Care Med 2006;173:393–397. Christakis NA, Iwashyna TJ. Attitude and self-reported practice regarding prognostication in a national sample of internists. Arch Intern Med 1998;158:2389–2395. Hansen-Flaschen J. Chronic obstructive pulmonary disease: the last year of life. Respir Care 2004;49:90–97. Knauft ME, Nielsen EL, Engelberg RA, Patrick DL, Curtis JR. Barriers and facilitators to communication about end-of-life care for patients with COPD. Chest 2005;127:2188–2196. Curtis JR, Engelberg RA, Nielsen EL, Au DH, Patrick DL. Patient–physician communication about end-of-life care for patients with severe COPD. Eur Respir J 2004;24:200–205. McNeely PD, Hébert PC, Dales RE, et al. Deciding about mechanical ventilation in end-stage chronic obstructive pulmonary disease: how respirologists perceive their role. CMAJ 1997;156:177–183. Elkington H, White P, Higgs R, Pettinari CJ. GPs' views of discussions of prognosis in severe COPD. Fam Pract 2001;18:440–444. Jones I, Kirby A, Ormiston P, et al. The needs of patients dying of chronic obstructive pulmonary disease in the community. Fam Pract 2004;21:310–313. Fried TR, Bradley EH, O'Leary J. Prognosis communication in serious illness: perceptions of older patients, caregivers, and clinicians. J Am Geriatr Soc 2003;51:1398–1403. Curtis JR, Engelberg RA, Young PJ, et al. An approach to understanding the interaction of hope and desire for explicit prognostic information among individuals with severe chronic obstructive pulmonary disease or advanced cancer. J Palliat Med 2008;11:610–620. Paling J. Strategies to help patients understand risks. BMJ 2003;327:745–748. Thomson R, Edwards A, Grey J. Risk communication in the clinical consultation. Clin Med 2005;5:465–469. Back AL, Arnold RM, Baile WF, Tulsky JA, Fryer-Edwards K. Approaching difficult communication tasks in oncology. CA Cancer J Clin 2005;55:164–177. White DB. Braddock CH 3rd, Bereknyei S, Curtis JR.. Toward shared decision making at the end of life in intensive care units: opportunities for improvement. Arch Intern Med 2007;167:461–467. Ehman JW, Ott BB, Short TH, Ciampa RC, Hansen-Flaschen J. Do patients want physicians to inquire about their spiritual or religious beliefs if they become gravely ill?. Arch Intern Med 1999;159:1803–1806. Anderson JM, Anderson LJ, Felsenthal G. Pastoral needs for support within an inpatient rehabilitation unit. Arch Phys Rehab Med 1993;74:574–578. Sprung CL, Maia P, Bulow HH, et al. The importance of religious affiliation and culture on end-of-life decisions in European intensive care units. Intensive Care Med 2007;33:1732–1739. Post SG Puchalski CM, Larson DB. Physicians and patient spirituality: professional boundaries, competency, and ethics. Ann Intern Med 2000;132:578–583. Hofmann JC, Wenger NS, Davis RB, et al. Patients' preferences for communication with physicians about end-of-life decisions. Ann Intern Med 1997;127:1–12. Back AL, Arnold RM, Quill TE. Hope for the best, and prepare for the worst. Ann Intern Med 2003;138:439–443. Carline JD, Curtis JR, Wenrich MD, Shannon SE, Ambrozy DM, Ramsey PG. Physicians' interactions with health care teams and systems in the care of dying patients: perspectives of dying patients, family members, and health care professionals. J Pain Symptom Manage 2003;25:19–28. McSweeny A, Heaton R, Grant I, Cugell D, Solliday N, Timms T. Chronic obstructive pulmonary disease; socioemotional adjustment and life quality. Chest 1980;77:309–311. Prigatano GP, Wright EC, Levin D. Quality of life and its predictors in patients with mild hypoxemia and chronic obstructive pulmonary disease. Arch Intern Med 1984;144:1613–1619. Light RW, Merrill EJ, Despars JA, Gordon GH, Mutalipassi LR. Prevalence of depression and anxiety in patients with COPD. Chest 1985;87:35–38. Engstrom CP, Persson LO, Larsson S, Ryden A, Sullivan M. Functional status and well being in chronic obstructive pulmonary disease with regard to clinical parameters and smoking: a descriptive and comparative study. Thorax 1996;51:825–830. van Ede L, Yzermans CJ, Brouwer HJ. Prevalence of depression in patients with chronic obstructive pulmonary disease: a systematic review. Thorax 1999;54:688–692. Kunik ME, Roundy K, Veazey C, et al. Surprisingly high prevalence of anxiety and depression in chronic breathing disorders. Chest 2005;127:1205–1211. Borson S, McDonald GJ, Gayle T, Deffebach M, Lakshminarayan S, Van Tuinen C. Improvement in mood, physical symptoms, and function with nortriptyline for depression in patients with chronic obstructive pulmonary disease. Psychosomatics 1992;33:190–201. Stapleton RD, Nielsen EL, Engelberg RA, Patrick DL, Curtis JR. Association of depression and life-sustaining treatment preferences in patients with COPD. Chest 2005;127:328–334. Blank K, Robison J, Doherty E, Prigerson H, Duffy J, Schwartz HI. Life-sustaining treatment and assisted death choices in depressed older patients. J Am Geriatr Soc 2001;49:153–161. Rosenfeld KE, Wenger NS, Phillips RS, et al. Factors associated with change in resuscitation preferences of seriously ill patients. Arch Intern Med 1996;156:1558–1564. Uhlmann RF, Pearlman RA. Perceived quality of life and preferences for life-sustaining treatment in older adults. Arch Intern Med 1991;151:495–497. Levenson JW, McCarthy EP, Lynn J, Davis RB, Phillips RS. The last six months of life for patients with congestive heart failure. J Am Geriatr Soc 2000;48: Suppl. 5 S101–S109. Sprangers MA, Aaronson NK. The role of health care providers and significant others in evaluating the quality of life of patients with chronic disease: a review. J Clin Epidemiol 1992;45:743–760. Wilson KA, Dowling AJ, Abdolell M, Tannock IF. Perception of quality of life by patients, partners and treating physicians. Qual Life Res 2000;9:1041–1052. Schneiderman LJ, Kaplan RM, Pearlman RA, Teetzel H. Do physicians' own preferences for life-sustaining treatment influence their perceptions of patients' preferences. J Clin Ethics 1993;4:28–33. Sprung CL, Carmel S, Sjokvist P, et al. Attitudes of European physicians, nurses, patients, and families regarding end-of-life decisions: the ETHICATT study. Intensive Care Med 2007;33:104–110. Tonelli MR. Pulling the plug on living wills – a critical analysis of advance directives. Chest 1996;110:816–822. Schneiderman LJ, Kronick R, Kaplan RM, Anderson JP, Langer RD. Effects of offering advance directives on medical treatment and costs. Ann Intern Med 1992;117:599–606. Danis M, Mutran E, Garrett JM. A prospective study of the impact of patient preferences on life-sustaining treatment and hospital cost. Crit Care Med 1996;24:1811–1817. Danis M, Southerland LI, Garrett JM, et al. A prospective study of advance directives for life-sustaining care. N Engl J Med 1991;324:882–888. Teno JM, Lynn J, Connors AFJ, et al. The illusion of end-of-life savings with advance directives. J Am Geriatr Soc 1997;45:513–518. Teno JM, Lynn J, Wegner N, et al. Advance directives for seriously ill hospitalized patients: effectiveness with the Patient Self-Determination Act and the SUPPORT Intervention. J Am Geriatr Soc 1997;45:500–507. Teno JM, Licks S, Lynn J, et al. Do advance directives provide instructions that direct care?. J Am Geriatr Soc 1997;45:508–512. Tilden VP, Tolle SW, Drach LL, Perrin NA. Out-of-hospital death: advance care planning, decedent symptoms, and caregiver burden. J Am Geriatr Soc 2004;52:532–539. Norris K, Merriman MP, Curtis JR, Asp C, Tuholske L, Byock IR. Next of kin perspectives on the experience of end of life care in the community setting. J Palliat Med 2007;10:1101–1115. Dales RE, O'Connor A, Hebert P, Sullivan K, McKim D, Llewellyn-Thomas H. Intubation and mechanical ventilation for COPD: development of an instrument to elicit patient preferences. Chest 1999;116:792–800. Singer P. Advance directives in COPD. Monaldi Arch Chest Dis 1995;50:62–63. Stevenson J, Abernethy AP, Miller C, Currow DC. Managing comorbidities in patients at the end of life. BMJ 2004;329:909–912. Fordham S, Dowrick C. Is care of the dying improving? The contribution of specialist and non-specialist to palliative care. Fam Pract 1999;16:573–579. Nava S, Sturani C, Hartl S, et al. End-of-life decision-making in respiratory intermediate care units: a European survey. Eur Respir J 2007;30:156–164. Curtis JR, Cook DJ, Sinuff T, et al. Noninvasive positive pressure ventilation in critical and palliative care settings: understanding the goals of therapy. Crit Care Med 2007;35:932–939. Block SD. Medical education in end-of-life care: the status of reform. J Palliat Med 2002;5:243–248.